As what may be the most common and convenient way to store and send multiple files, the ZIP file format is used by essentially everyone online. That being the case, there's a good chance you'll eventually come across one that has been corrupted, not least because only a single corrupt bit in one file out of dozens inside the ZIP could prevent your file archiver from opening or extracting its contents. Corrupt files can result from a variety of issues including bad drive sectors, malware, an incomplete download or transfer such as during a drop in your connection, or any other sudden interruption like a power failure or an improper shut down while working with the ZIP file. 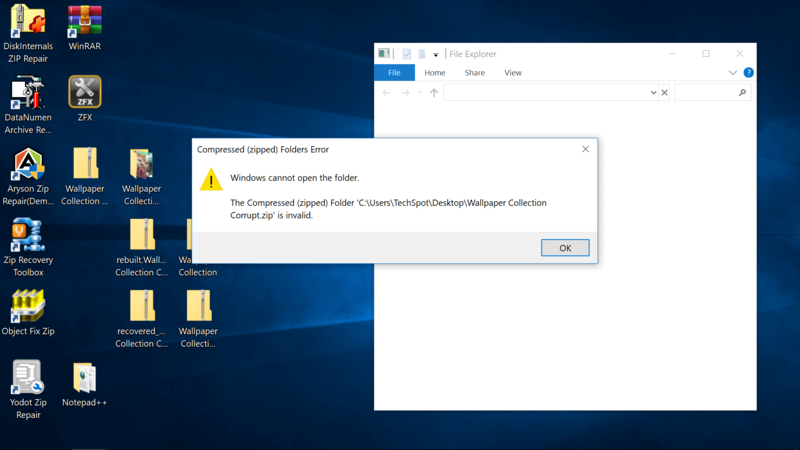 "Windows cannot open the folder. 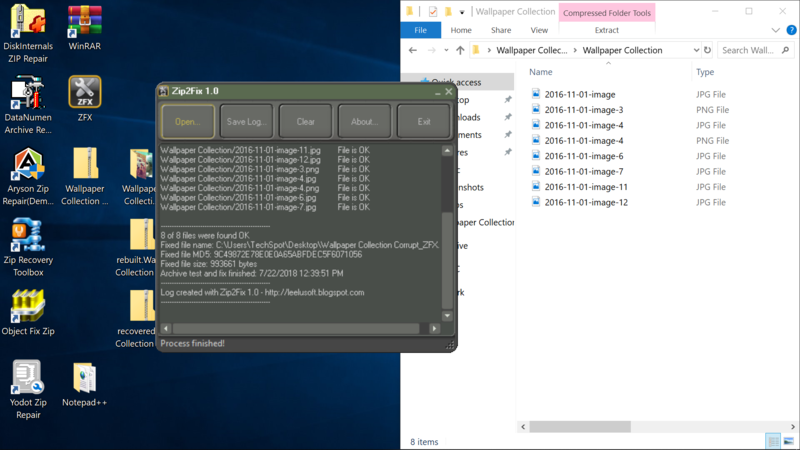 The Compressed (zipped) Folder 'C:\Users\TechSpot\Desktop\Wallpaper Collection Corrupt.zip' is invalid"
We recreated a corrupt ZIP file by archiving an old collection of wallpapers and deleting parts of the file's code using a hex editor (Notepad++). 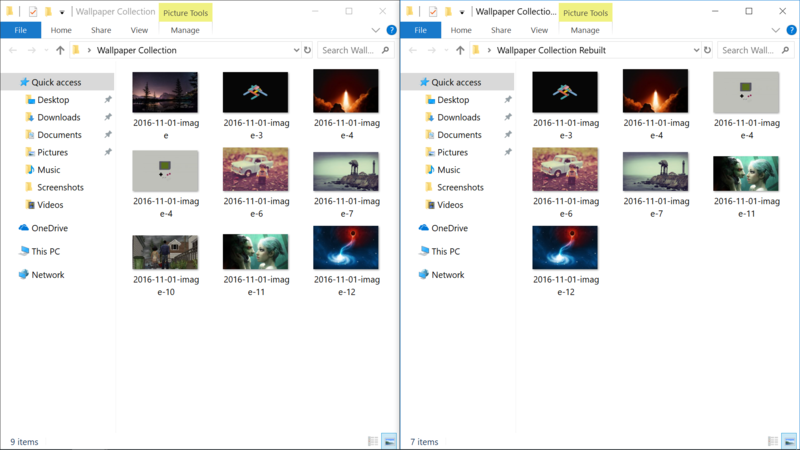 In doing so, our collection dropped from nine images to one and we couldn't actually open the file even though it was still being displayed in the file explorer. Your rate of success recovering anything from an archive will vary depending on the tool you use, the contents of your ZIP and the degree to which it has been corrupted. Starting with the software that you are most likely to have installed already, WinRAR provides a built-in repair tool for damaged ZIP files. Open the file, then go to Tools > Repair archive. WinRAR managed to recover seven out of the nine files from our damaged archive. However, the software is only free for 40 days, after which a license to continue using the software will cost you about $30. WinZip and 7-Zip don't seem to have integrated repair tools but the companies do offer good information pages about corrupt ZIP files. DiskInternals Zip Repair - Free to download, it managed to recover eight out of the nine original files. It's dedicated to repairing zip files so it has less clutter to navigate than WinRAR and it launches with a wizard-style prompt instead of you having to go through any menus. Zip2Fix - Tied for first place recommendation. Its spartan interface has even less clicks involved than DiskInternals: you open the corrupt ZIP and the software automatically begins its process and outputs any recovered files to the source directory without asking or prompting about anything. It worked as well as DiskInternals, recovering eight of the nine files (and again, that's one better than WinRAR). As a final freebie mention, Object Fix Zip has a similar interface to DiskInternals Zip Repair but for some reason it didn't manage to recover any of the images from our test ZIP, making it difficult to recommend before DiskInternals or Zip2Fix, or even WinRAR. Likewise, there are also many licensed utilities dedicated to recovering files from broken archive files and in our testing all of them provided about the same level of service as the freeware solutions mentioned above except that they don't let you extract the files without paying, though they do at least show you the files that are available for recovery. DataNumen Archive Repair (formerly Advanced Archive Repair) claimed to have recovered eight of the nine files with 100% accuracy but again the freeware version doesn't provide access to the files. Instead, they are locked behind a $49.95 license fee for DataNumen Zip Repair or as much as $200+ for DataNumen Archive Repair, which supports additional file types such as Unix TAR and Windows CAB archives. That said, its interface seems less polished than DiskInternals or Zip2Fix, which are free and had the same success rate. Similarly, Yodot ZIP Repair has a click-heavy interface compared to DiskInternals Zip Repair and locks your files behind a $30-$200 paywall after recovering them, as do Aryson Zip Repair Software ($24) Zip Recovery Toolbox ($27+). The only other reason that you may not be able to open a ZIP file is because of a forgotten password. It's worth mentioning that although ZIP Recovery Toolbox and some of the other utilities mentioned above will process password-protected files, they'll still require you to provide the password to complete the recovery. However, if you've forgotten your password, there are also utilities specifically for that issue. iSeePassword comes to mind as a utility we've tested previously for recovering Windows passwords and for about $30 the company offers a tool that supports archive, office as well as many other file types.